Carmen Kynard, Associate Professor of English at John Jay College of Criminal Justice, gave her fabulous keynote, “‘Pretty for a Black Girl’: AfroDigital Black Feminisms and the Critical Context of ‘Mobile Black Sociality,’” at the Thomas R. Watson conference at the University of Louisville on Thursday morning, October 20th. Kynard began her talk with a brief, but vivid summary of her article of the same name. 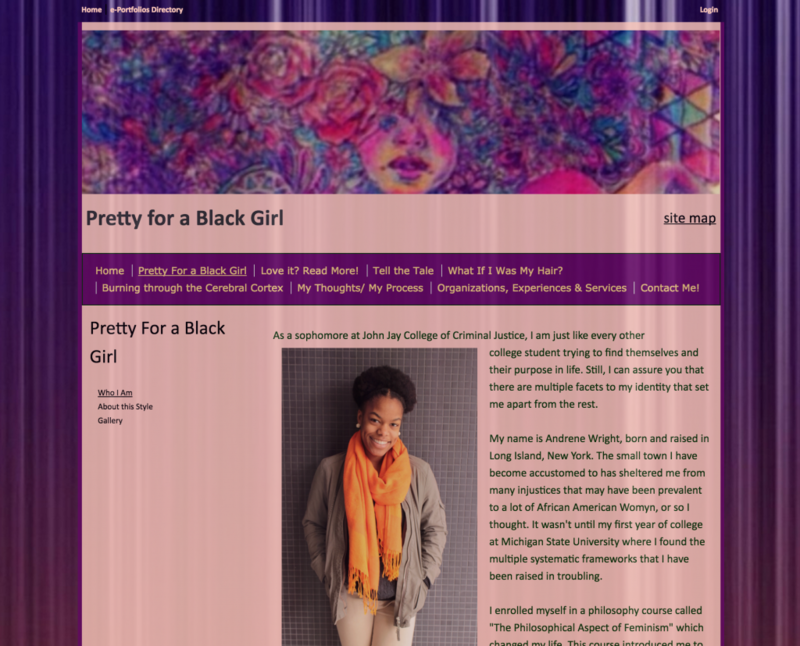 The article centers on a young woman named Andrene who created “a dope website/ePortfolio” called “Pretty for a Black Girl” (pictured below). Andrene’s website uses space, color, sound, images, links, and language to critique the color caste system which values beauty based on its proximity to whiteness. 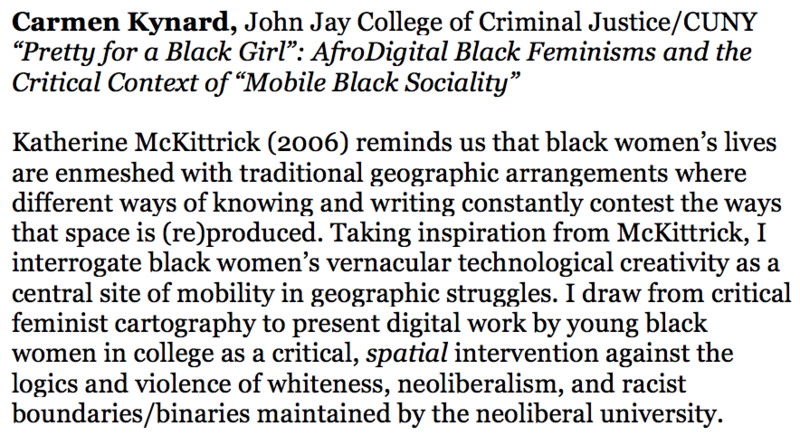 The article draws on the work of cultural geographer Katherine McKittrick’s (2006) and Fred Moten’s (2015) concept of “mobile black sociality,” to help readers see how Andrene’s website leverages “AfroDigital black vernacular” (ADBV) to critically and spatially intervene in the racism of the neoliberal university. Here, then, Andrene uses color–an extra-linguistic component of ADBV–to enact her AfroDigital black feminism, re-approrpriating purple as positive, rather than negative, symbol of black female beauty. These are questions that deserve our attention as scholars, instructors, and media consumers/producers ourselves. Indeed, this kind of criticism of ADBV strikes me as not wholly unlike the faculty member who ripped up Kynard’s copier materials, the faculty member who told Andrene that her website was too unprofessional and provocative, and even the recent federal court of appeals decision that banning employees like Chastity Jones from wearing their hair in dreadlocks is not racial discrimination. In all of these cases—Kynard’s copier materials, Andrene’s embodied literacies, a black woman’s hair—black women are being told that they, themselves, are inappropriate. So, let’s get on it. Margaret Bertucci Hamper is a PhD candidate in composition and rhetoric and Assistant Director of the intermediate writing program at the University of Wisconsin Madison. Her research focuses on the intersections of literacy, race, and class. Thanks for this review, Maggie! It was a powerful talk!